Hello, I’m Motty, a highly skilled and motivated professional with 18+ years of experience in Hi-Tech industry serving in various executive positions: Head of R&D, Head of Innovation, CTO and other key roles (you can read more in my LinkedIn profile). During my diverse career and technology background, I gained a lot of knowledge and experience in software engineering, architecture and development. I have learned that nothing is impossible and even the most hallucinatory idea can be realized – not always in the obvious and strait forward approach, sometimes (most of the times actually) an innovative and outside-the-box thinking is required, but it is doable. Like most of us, I do have a personal life. 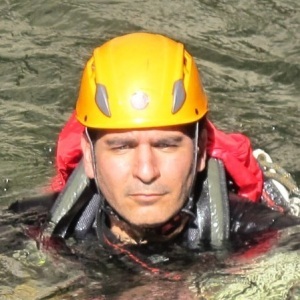 In my spare time I like to do some activities like: Skiing, Mountain biking, Kayaking, Canyoning (as you can see in the photo), Fishing, Hiking and Traveling.